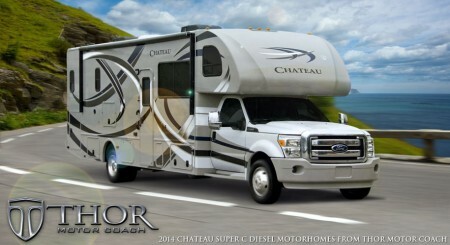 Thor Motor Coach is expanding their lineup of Class C Diesel Motorhomes. 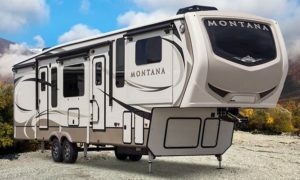 Filling a void in the Class C RV marketplace, the new Thor Motor Coach 35SK joins the ranks of “Super C Motorhomes” built to satisfy consumers’ needs for a heavy-duty diesel-powered Class C motorhome. Coveted for its exceptional living space, the 35SK Super C RV creates an ideal lounging area at the center of the coach. The TV cabinet is located straight across from an ample sofa and dinette configuration. A slide-out expands that sofa/dinette area creating an entertaining hub. For the high-tech aficionados, a cab-over home theater entertainment center with 50”, big-screen, LCD TV and sound bar can be optioned in the cab-over, replacing the standard 32” LCD TV. The interior is loaded with residential-home designs. The rich furniture is complimented with overhead efficient LED lighting. In the kitchen, a residential 18-cf. refrigerator and 30” over-the-range microwave allow ease of food preparation. An oversize pantry and pull-out countertop adds space and convenience. The motorhome’s bedroom boasts a premium “King” size Denver Mattress™ sleep system and abundant storage. The split bath with a private stool highlights yet another ingenious use of space and design in the 35SK line of Super C Motorhomes. 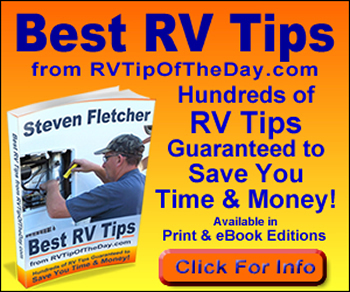 Consumers have touted the drivability of these diesel-powered Super C Motorhomes. With a solid foundation of the Ford F-550 you’ll benefit from generous carrying capacity and commanding towing ability. The PowerStroke 6.7L diesel engine, pumps out 300-hp and 620-lb.ft. of torque. 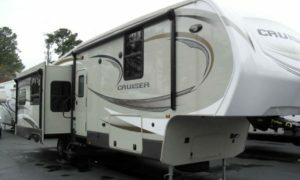 The diesel engine is completely housed out in front of the passenger compartment offering a much sought after passenger car ride. Go Wild for National Parks!